Coach Sean Payton said Friday that it's realistic for Ginn (knee) to return from injured reserve in the minimum eight weeks, Rod Walker of The New Orleans Advocate reports. The Saints will place Ginn (knee) on injured reserve Thursday, Field Yates of ESPN reports. Ginn (knee) didn't participate in practice Wednesday, Luke Johnson of The New Orleans Times-Picayune reports. Analysis: Ginn has dealt with a knee injury for most of the season and eventually took a seat Week 5 against Washington. After having the bye week to heal up, he remains a non-participant in practice. Fellow wideout Cameron Meredith was limited Wednesday by his own knee injury, ensuring uncertainty with the state of the Saints' receiving corps heading into Sunday's game in Baltimore. Ginn will have two more chances to make an appearance at practice or risk yet another absence. Ginn (knee) didn't participate in the open portion of practice Wednesday, Josh Katzenstein of The New Orleans Times-Picayune reports. Analysis: It appears the bye week didn't provide quite enough time for Ginn to make a full recovery from the knee injury that kept him out in Week 5. Another absence Sunday in Baltimore would free up playing time for Cameron Meredith and Tre'Quan Smith, though it's still possible Ginn makes it back to practice by the end of the week. The Saints have ruled out Ginn (knee) for Monday's matchup with the Redskins, Josh Katzenstein of The New Orleans Times-Picayune reports. Analysis: Ginn has been nursing a knee issue since week 1, but has toughed through it up until now. The Saints have a bye week following this Monday's game, so it looks like he will have extended time to rest and allow the injury to heal. 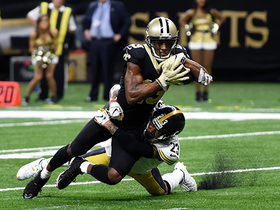 His absence means the Saints could rely even more on Michael Thomas in the passing game, while Cameron Meredith and Tre'Quan Smith should see their workload increase as well. Ginn (knee) was withheld from practice Friday, Mike Triplett of ESPN.com reports. Analysis: Ginn has been dealing with a knee injury since Week 1 and has yet to miss a game. Back-to-back practice absences isn't a great sign, but he does have an extra day to get ready with the Saints hosting the Redskins on Monday Night Football in Week 5. Another update on Ginn's status for that contest will come Saturday when the Saints release their final injury report. Ginn (knee) was a non-participant in Thursday's practice, Josh Katzenstein of The New Orleans Times-Picayune reports. Analysis: Ginn was troubled by a knee issue last week, but he advanced to full practice by Thursday to ensure his availability for the team's 33-18 win over the Giants. It's unclear if he experienced a setback with the knee in that contest or if the Saints were simply withholding him for the first practice of Week 5 for precautionary purposes. A better picture of Ginn's health -- as well as his status heading into Monday's matchup with Washington -- should come by the team's final practice Saturday. Ginn failed to haul in any of his three targets, but he did gain one yard on a carry in Sunday's 33-18 win over the Giants. Analysis: Ginn was blanked by a surprisingly effective Giants secondary, which held quarterback Drew Brees out of the end zone and didn't allow any of New Orleans' wide receivers to break 50 yards. Cameron Meredith -- who's pushing Ginn for the No. 2 wide receiver job behind Michael Thomas -- finished with three catches for 32 yards on four targets. Ginn will look to create some separation between himself and Meredith in Week 5 against the Redskins. Ginn (knee) practiced fully Thursday, the Saints' official site reports. Analysis: Ginn's practice reps have been managed the past three weeks as a result of a knee injury, but it hasn't stopped him from taking the field on game days. 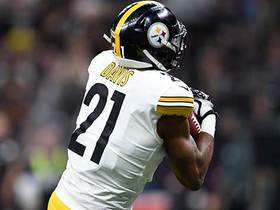 After three contests, he's received at least six targets in each one, sitting a distant third (6.3 per game) on the team to Michael Thomas (13.3) and Alvin Kamara (12.7). Ginn will look to produce Sunday versus a Giants defense that has conceded 8.0 yards per target to wide receivers this season. Ginn was limited at Wednesday's practice due to a knee injury, Luke Johnson of The New Orleans Times-Picayune reports. Analysis: The Saints capped Ginn's practice reps last week as well, but he gained clearance in time for Sunday's game in Atlanta. During the Saints' overtime win, Ginn managed season lows in catches (three) and yards (12), but one of those grabs doubled as his second touchdown of the season. Assuming he follows a similar practice regimen this week, he'll take on a Giants defense in Week 4 that has allowed 8.0 yards per targets but just one touchdown to wideouts through three contests. Ginn caught 3-of-6 targets for 12 yards, including a four-yard touchdown reception, in Sunday's win against the Falcons. He also gained 20 yards on one carry. Ginn (knee) doesn't have a designation on the final injury report for Sunday's game in Atlanta, D. Orlando Ledbetter of The Atlanta Journal-Constitution reports. Analysis: The Saints have reduced Ginn's practice workload the past two weeks in an effort to reduce stress on his ailing knee. He was a limited participant throughout the week, never in true danger of missing Sunday's potential shootout. Ginn will fill his usual role as the No. 2 wide receiver in an offense that's been heavily reliant on Michael Thomas and Alvin Kamara. Ginn (knee) expects to play in Sunday's game in Atlanta, Joel A. Erickson of The New Orleans Advocate reports. Analysis: Ginn has kicked off Week 3 preparations with back-to-back limited practices, placing a cloud over his availability. 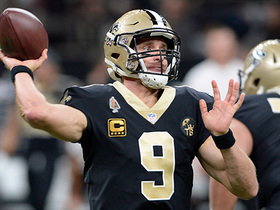 He brushed off some of the doubt with his comments Thursday, but until he ditches the knee injury -- either via Friday's injury report or the release of the Saints' inactive list Sunday -- he'll remain a question mark. If he suits up, there's a chance he adds punt returns to his workload with the placement of Tommylee Lewis (knee) on injured reserve this week. Ginn (knee) is a candidate to return punts according to head coach Sean Payton, Jeff Duncan of The New Orleans Times-Picayune reports. Ginn was limited at Wednesday's practice due to a knee injury. Analysis: Ginn has played third fiddle in the Saints' passing attack through two games this season, with his 13 targets ranking behind Michael Thomas' 30 and Alvin Kamara's 18. The workload has produced a fair enough line of nine catches for 123 yards and one touchdown. After Wednesday's limited session, Ginn appears as if he'll be able to uphold that standard Sunday in Atlanta, but Friday's injury report will give the final work on his Week 3 availability. 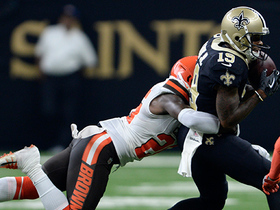 Ginn had four catches on seven targets for 55 yards in Sunday's win against the Browns. Ginn (knee) doesn't have a designation for Sunday's contest against the Browns. Analysis: Ginn was included on the Saints' initial Week 2 injury report as a non-participant due to a knee injury, but he gradually built up his activity level, logging a limited session Thursday before taking every rep Friday. He's thus set to take on a Browns defense that gave up 313 passing yards to the Steelers in the regular-season opener. Ginn (knee) was a limited participant in Thursday's practice, Mary Kay Cabot of The Cleveland Plain Dealer reports. Ginn (knee) returned to practice Thursday, Josh Katzenstein of The New Orleans Times-Picayune reports. Analysis: Ginn opened the season with five catches (on six targets) for 68 yards and one touchdown Sunday against the Buccaneers while playing 50 of 64 offensive snaps. The productive outing was followed by a DNP on Wednesday, though, placing a fog over his Week 2 availability. A return Thursday is a good sign for Sunday's game against the Browns, but until the injury report is released, its unclear if he was limited or progressed all the way to a full participant. Ginn didn't practice Wednesday while nursing a knee injury, Josh Katzenstein of The New Orleans Times-Picayune reports. Analysis: Ginn didn't seem to have any limitations in Sunday's 48-40 loss to Tampa Bay, logging 50 of 64 snaps on offense while drawing targets deep into the fourth quarter. This may just be a matter of maintenance, but it should be taken more seriously if he isn't back at practice Thursday. Ginn caught five passes on six targets for 68 yards and a touchdown in Sunday's loss to the Buccaneers. He also gained five yards on one carry. Ginn caught two passes on four targets for seven yards in Friday's preseason game against the Cardinals. Ginn is one of four Saints wideouts assured of a roster spot, along with Michael Thomas, Cameron Meredith (knee) and rookie Tre'Quan Smith, Larry Holder of The Times-Picayune reports. Ginn caught eight of 11 targets for 72 yards during Sunday's 29-24 NFC divisional-round loss to the Vikings. He also took one carry for eleven yards. Ginn caught four of six targets for 115 yards and a touchdown in Sunday's 31-26 NFC wild-card win over the Panthers. Analysis: Ginn burned his former team with a season-long, 80-yard touchdown to close the first quarter. With the help of that timely contribution, Ginn accumulated his second-most yards in any game this season. Still capable of speeding past defenders, Ginn now boasts solid momentum heading into next Sunday's divisional-round clash versus the Vikings. Ginn caught three passes on six targets for 33 yards in Sunday's 31-24 loss to the Buccaneers. He also had one carry for two yards. Analysis: Ginn did little in the Saints' regular-season finale, but he should have had a much bigger afternoon, as quarterback Drew Brees overthrew him on what should have been a 72-yard touchdown in the first half. Still, Ginn seems healthy after dealing with a late-season rib injury that sidelined him in Week 15. The former Carolina Panther remains the Saints' No. 2 receiver and will face his old team in the first round of the playoffs next Sunday. Ginn (ribs) does not have a designation on the final injury report for Sunday's game against the Falcons. Analysis: Ginn may have been healthy enough to play last week if the Saints had really needed him, but the team unsurprisingly opted for a cautious approach as heavy favorites against the Jets. With the need far greater this time around, Ginn logged a full practice Friday in preparation to return for Sunday's crucial NFC South battle. Ginn (ribs) was a limited practice participant Wednesday, Joel A. Erickson of The Baton Rouge Advocate reports. Analysis: Ginn picks up right where he left off last week, when he was listed as questionable on the final injury report after logging limited practices Thursday and Friday. 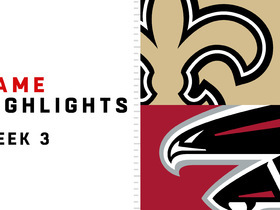 He didn't end up playing in a win over the Jets, but a more aggressive approach could be in order with the Saints facing a tougher test (the Falcons) this coming Sunday. 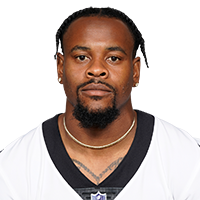 Ginn (ribs) is inactive for Sunday's contest against the Jets, Josh Katzenstein of The New Orleans Times-Picayune reports. Analysis: Afforded the gift of a lengthy respite between games due to a Thursday night outing Week 14, Ginn won't suit up due to a rib injury that allowed him to practice on a limited basis twice this week. Perhaps the Saints have an eye on the future, but Ginn's absence will give Willie Snead and (to a lesser extent) Tommylee Lewis an opportunity to make an impact against the Jets' 19th-ranked pass defense. Ginn (ribs), who is listed as questionable for Sunday's game against the Jets, won't play in the contest, according to a source familiar with his situation, Jane Slater of NFL Network reports. Ginn (ribs) remained limited at Friday's practice and is listed as questionable for Sunday's game against the Jets, Nick Underhill of The Baton Rouge Advocate reports. 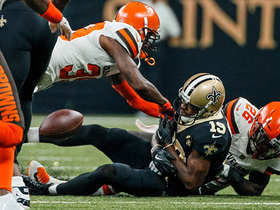 Ginn (ribs) turned in a limited practice Thursday, Herbie Teope of The New Orleans Times-Picayune reports. Analysis: Ginn's involvement in practice Thursday suggests that his day off Wednesday was likely for maintenance-related reasons more than out of any overwhelming concern about his injury. if the wideout is able to take part fully Friday, he'll likely enter the Week 15 game against the Jets without an injury designation. Ginn was held out of Wednesday's practice due to a rib injury, Josh Katzenstein of The New Orleans Times-Picayune reports. Analysis: Ginn has had a handful of spectacular efforts this season, namely a seven-catch, 141-yard performance at Green Bay in Week 7. Lately, though, his name hasn't been called much, as evidenced by four receptions (on five targets) for 37 yards over the last two games. The rib issue may have hindered Ginn, but his snap count of 35 was in line with his season-long workload. Fortunately for the veteran wideout, he has a pair of practices to put any questions about his health to rest. Ginn brought in both of his targets for 10 yards and lost three yards on his sole carry in Thursday's 20-17 loss to the Falcons. Ginn caught two of three targets for 27 yards and added six yards on one carry in Sunday's 31-21 win over the Panthers. 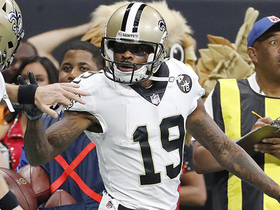 Analysis: Ginn set or matched his season-high marks for receptions (seven) and targets (11) the previous week in a 26-20 loss to the Rams, but he accounted for just three of Drew Brees' 34 pass attempts in Sunday's win over the wideout's former team. Given his status as the No. 4 option in the offense behind Mark Ingram, Alvin Kamara and Michael Thomas, there will inevitably be some empty weeks for Ginn when he doesn't break off a long gain. Ginn caught seven passes on 11 targets for 71 yards in Sunday's loss to the Rams. Ginn caught all six of his targets for 87 yards in Sunday's 34-31 comeback win against the Redskins. Ginn caught one pass on one target for three yards in Sunday's win against the Bills. 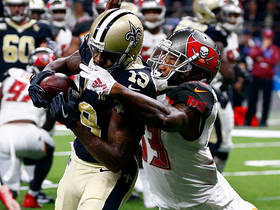 Ginn hauled in four of five targets for 59 yards and a touchdown, gained 21 yards on two kickoff returns and lost five yards on two punt returns in Sunday's 30-10 win over the Buccaneers. 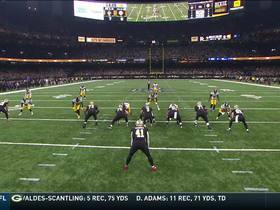 Analysis: Ginn hauled in a 36-yard scoring throw from Drew Brees in the third quarter to close out the Saints' scoring on the day. The 11-year veteran has mostly lived up to his big-play reputation since arriving in New Orleans, posting a 17.1 YPC and already logging nine receptions of more than 20 yards -- matching his 2016 figure in that category -- including four over 40. Ginn will look to continue the productive start to his Saints tenure versus the Bills in Week 10.